AFC Littlehampton Ladies got their League Cup charge up and running with an extra-time victory over Crawley Wasps third. Pippa Langridge's second of the game came on 95 minutes as Littlehampton held their nerve to clinch a 4-3 first-round triumph. Although Golds were pushed all the way, being pegged back after opening up a 3-0 lead. It was a fourth successive win for AFC in all competitions and they will look to maintain challenges in the Sussex League and League Cup. Despite the heavy pitch, Littlehampton turned on the style with some superb passing that caught Wasps somewhat by surprise. Wave after wave of Golds attacking play was inevitably going to end with the deadlock being broken. Captain Steph Carter spotted the Wasps goalkeeper off her line, dispatching the perfect shot to fire the hosts ahead. Littlehampton’s defence of goalkeeper Lani Smith, Kim Chrimes, Laura Holmes and Mel Miller were up against a classy Wasps strikeforce, however, they dealt with any danger superbly. On 25 minutes, skipper Carter floated a free-kick to the far post with Chloe Ansell timing her run to perfection and smashing home a volley from six yards. Strike pair Emma Chrimes and Pippa Langridge were giving the Wasps defence a torrid time and combined to perfection following a perfectly-weighted pass from Katie Burling and up stepped Langridge to finish from close range. The game took a strange turn in the second half. The visitors were controlling areas of the pitch which were hurting Littlehampton and with heavy legs in the Golds’ ranks, they couldn't prevent Wasps clawing their way back into the game scoring three in 12 minutes. The equaliser, which was going wide, took a cruel deflection sending Smith the wrong way which took the game to extra-time. 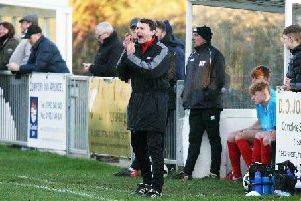 Littlehampton regrouped for extra-time and their never-say-die attitude and team spirit was appreciated by the home crowd who did everything they could to spur Littlehampton to victory. On 95 minutes, Langridge scored her second of the game and put the Golds into a lead. As the whistle blew for full-time, the players dropped to their knees in utter jubilation.